This post brought to you by Spray Nine. The content and opinions expressed below are that of 95octane. If there’s one major part of most cars that gets neglected in the regular washing process, it’s the area under the hood. It’s kind of crazy when you think about it. 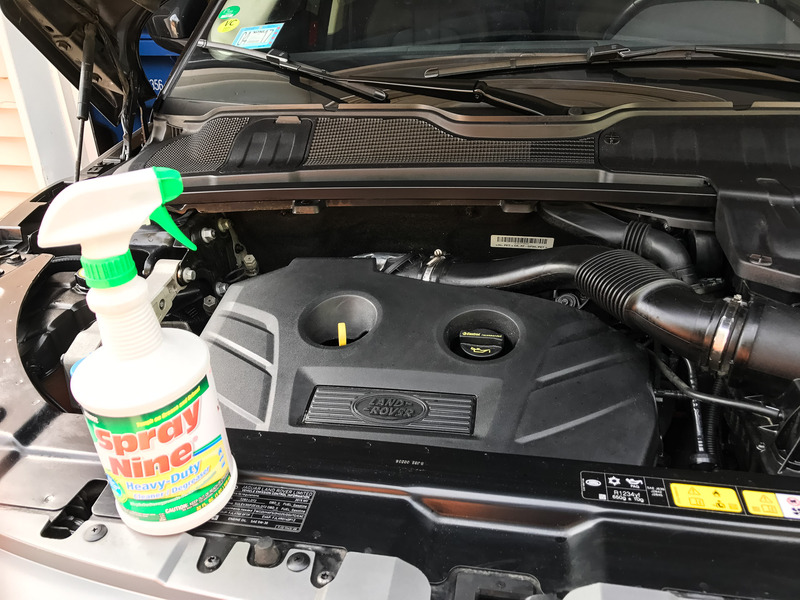 We’re fastidious about the exterior appearance of our cars, but the critical components that keep your vehicle driving are subject to dirt, dust, and grime for months or even years without cleaning. Unless you go to an expensive hand wash, they won’t even offer engine cleaning as an option, and then it’s expensive. But with a bottle of Spray Nine and a little elbow grease, you can keep your engine compartment nice and clean with just a few minutes of work when you get home from the car wash. I can say with a high degree of certainty that the engine compartment of my wife’s Evoque has never been cleaned in the 2+ years she’s been driving it, so it was super nasty and dirty under there when I opened the hood. But I was able to get all of the surface dirt and gunk off within about 10 minutes after a good dose of Spray Nine. I just sprayed this impressive heavy-duty cleaner onto all of the exposed surfaces, let it sit for a couple of minutes, and wiped away all the nasty grime like it was nothing. A few rags later, and the engine compartment looks as good as the day it left the dealership. 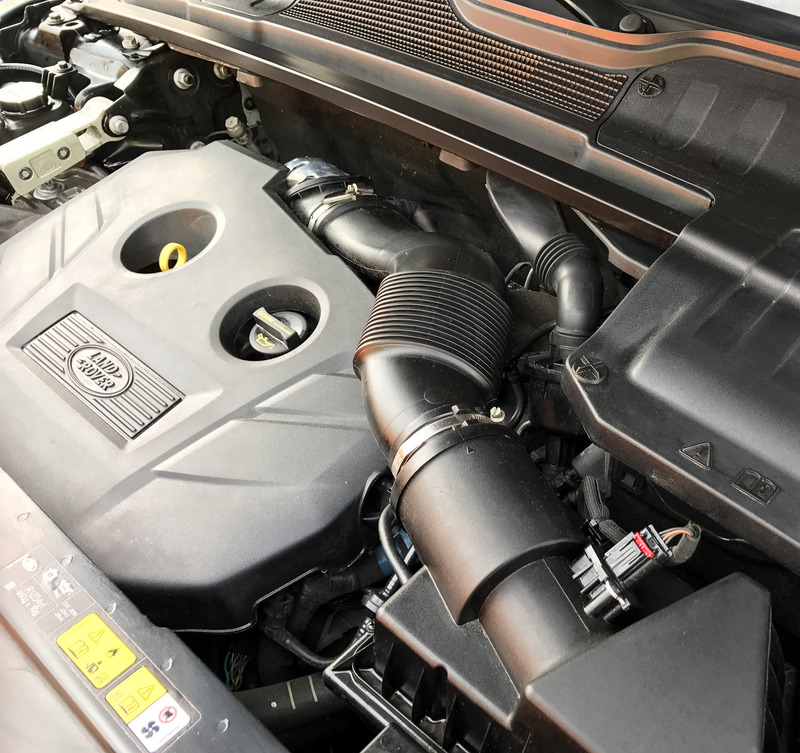 While the cosmetic benefits of keeping your engine compartment clean are obvious, keeping those parts free of dirt and debris will also pay off in the long term with fewer components failing, and longer life for filters, relays, connectors, and other parts which wear more quickly when exposed to grime. So that said, you owe it to your car to keep its engine compartment tidy. 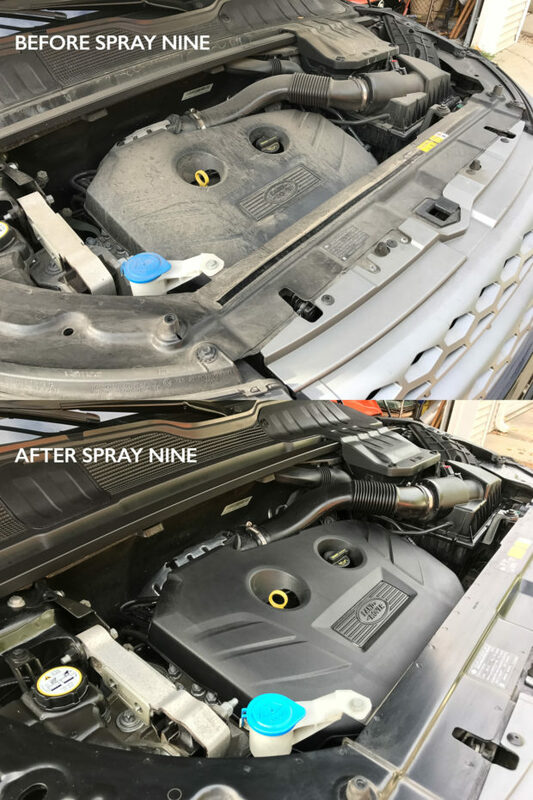 Spray Nine’s formula is designed to remove dirt, grime, grease, mold, mildew, and even kill viruses. It cleans everything from car engines and dashboards to wheels, vinyl tops, door panels, and more. It also doubles as a household cleaner, so you can use it to clean your patio furniture, bathroom fixtures, BBQ grill, ceramic tile, pool areas and much more. It’s also bleach and corrosive free. 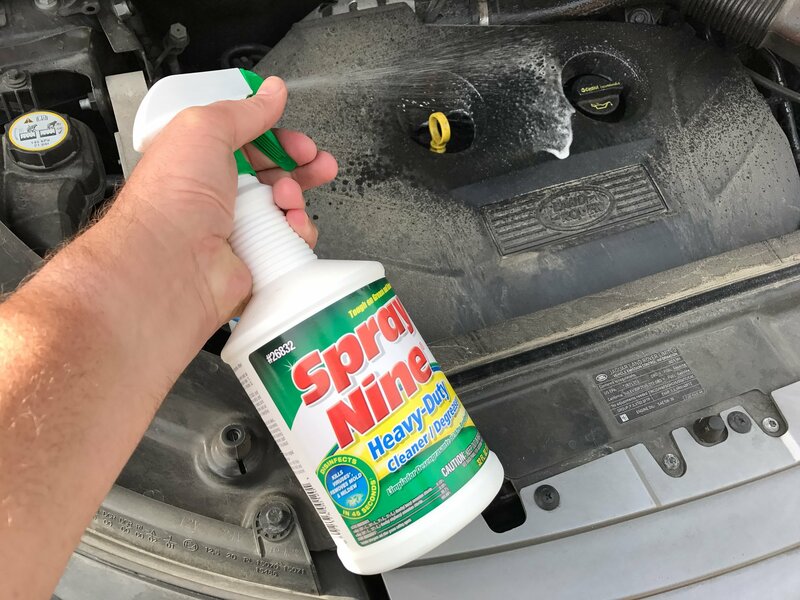 If you’ve got a problem with lots of tough dirt, grease, or grime, Spray Nine is a great solution. See what Spray Nine Heavy Duty can do for you. 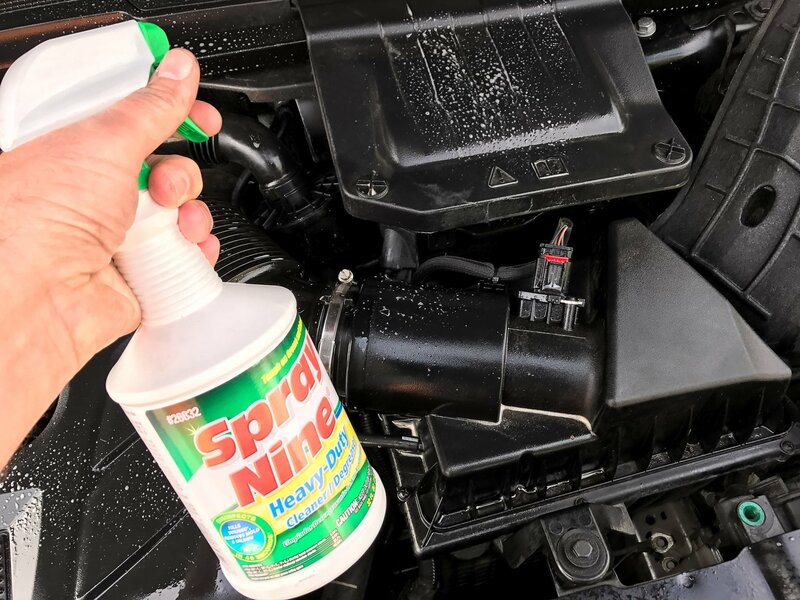 Take the Spray Nine Challenge.